Our Vision is to establish functional literate communities in Africa to bridge the gap between poverty and prosperity. Our Mission is to help build economically stable and productive societies in African communities by ensuring access to self-sustaining educational centers for its citizens. 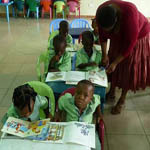 Encouraging Lifetime reading and Learning Habits among African Children is what we do best! The Compass For Your Cause Program allows you to support our organization, by doing something done virtually every day�use your check card for everyday purchases. And it's easy to get started Support Wings of the Dawn...order your personalized check card today! Trinity Valley School in collaborative partnership with Wings of the Dawn Book Cafe present a Free Workshop and Performance.